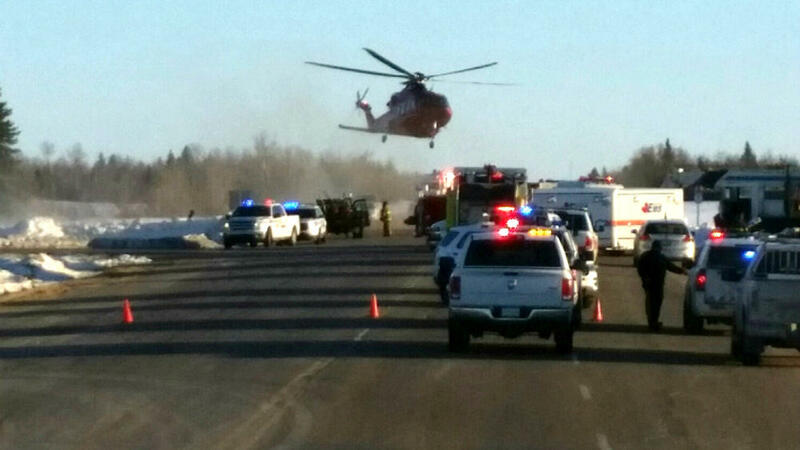 Emergency crews respond to a crash involving a bus carrying the junior hockey team. Police say 15 people died. "It's disbelief. It's shock," the team's president, Kevin Garinger, told the Saskatoon Star-Phoenix. "The deepest grief that you can ever imagine." A semitrailer hit the team's bus near the city of Tisdale, Saskatchewan, at 5 p.m. local time Friday, the RCMP says. The Broncos were traveling about 125 miles to Nipawin for a playoff game that evening. The crash prompted a wide showing of national grieving and support in Canada, where hockey is a symbol of national pride and many young people play. Prime Minister Justin Trudeau tweeted his support for Humboldt. President Trump tweeted Saturday that he spoke with Trudeau to "pay my highest respect and condolences to the families of the terrible Humboldt Team tragedy." Scott Moe, premier of the Saskatchewan province, where the team is from, offered support to the town and thanked first responders. "Our province has always been one community," Moe wrote on Facebook. "At our core, we are one small town, neighbours, friends and families." That is especially true of Humboldt, a town of less than 6,000 people in Canada's Great Plains region. Speaking to reporters, Mayor Rob Muench recalled a recent game when the team was down. "And they came back," he said. "So we're hoping to do that as a community as well." Many of the town's residents gathered Friday night at Elgar Petersen Arena, where the Broncos play their home games. The Star-Phoenix reports that the sound of people asking for updates on the phone was occasionally punctuated by groups of people sobbing. "We were a family," a former Broncos player, Daigon Elmy, told the Canadian Broadcasting Corporation. "You come to the rink ... what's better than that? Now I don't know what goes on." The RCMP hasn't released many details about the crash. It says an investigation is taking place. But the president of the Nipawin Hawks, who were scheduled to be the Broncos' opponent Friday, told the Star-Phoenix the truck had "T-boned" the bus. The father of one of the team's players described a crane lifting the bus after the wreck. For many Canadians, this crash was reminiscent of another one involving youth hockey players in Saskatchewan. A 1986 crash outside of Swift Current killed four junior hockey players.